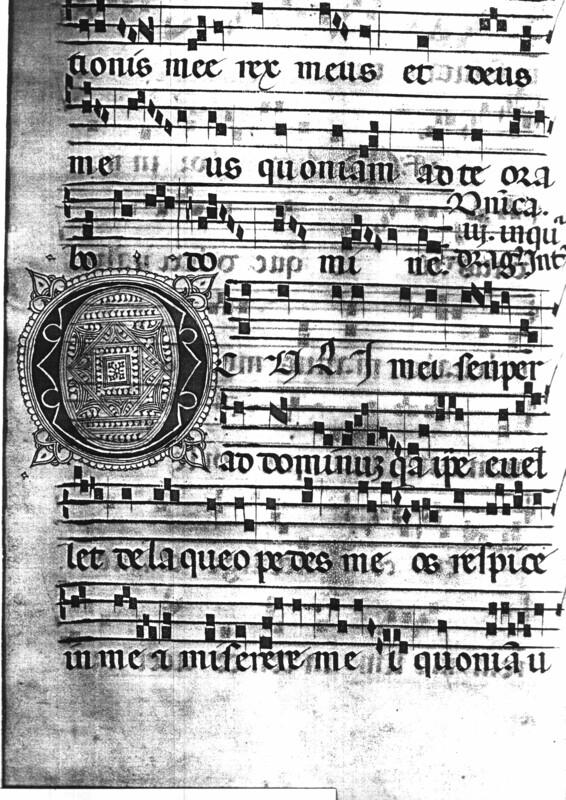 This is a leaf from an antiphonal (also called an "antiphonary" or "antiphoner"), a collection of sung responses in the Latin mass. It was created in early fifteenth-century Italy, and measures 35.5 x 24.5 cm. Its chief visual interest lies in its four-line staves rendered in strong red ink; there are usually six or seven of these per recto or verso, and the Lombardic initials are sized to fit perfectly between them. If you compare the various pages you will find that there are actually several sizes and degrees of letter decoration, and at least two shades of both red and blue at use. By contrast, the black ink used for the notes and the text is less substantial. The pages exhibit two forms of numbering: Roman numerals in red in the center of the top margin, and Arabic numerals in ink in the upper right corner. Some leaves, such as the one in the Ohio State University set, are palimpsestic. See Denison University Leaf 27 for more information about this manuscript. Text: Not yet identified. A scan of the verso is not currently available. tiónis meae, Rex meus et Deus meus. Quóniam ad te orábo Dómine. Unica iii. inqu. [ ] Int. prayer, O my King and my God. 4 For to thee will I pray O Lord.